July 01, 2018: When you are on one of your midnight fast food runs with your friends, you better not forget your house keys, nor your HUAWEI P20 Pro. A camera which works like a literal pupil, shifting with different exposures, the HUAWEI P20 Pro’s lens adapt to every landscape, in attempts to capture the most idyllic of shots. 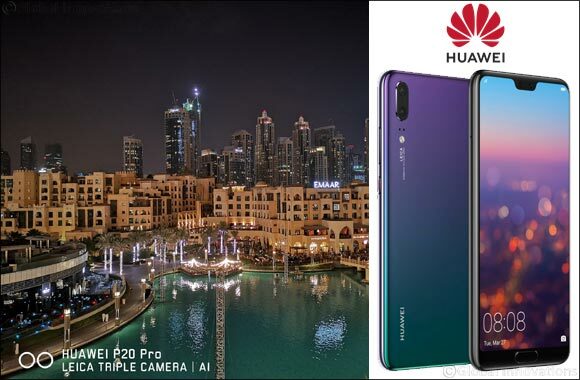 We tested out the HUAWEI P20 Pro’s camera against the city scape of Dubai at night, and it’s safe to say that the sought-after smartphone is a clear winner in our eyes. The issue of tackling night time shots has plagued the minds of smartphone manufacturers for long, and it has been the root cause of pixilated, greyish night-time imagery. But worries be gone! The HUAWEI P20 Pro eliminates all the challenges about night time photography and crystalizes all the elements which makes night shots beautiful. When you try to decipher what tricks the phone might hold, you will find the revolutionary AI powered camera that can effortlessly make you a professional photographer. The smartphone intelligently recognises different scenes and objects, switching from various modes with AI integration, and once it is identified, Huawei P20 Pro does the trick for you. Whether you are shooting a blue sky, a beach, a dog or a person, the smartphone adjusts for the best lighting effects. The no hassle approach denotes to quality photographs without stress of adjusting different ratios on manual mode, enabling users to click away impeccable photographs instantaneously. Using three different cameras, the HUAWEI P20 Pro produces sharp shots which are also true to real life, natural colours. The incredible photography that the smartphone produces allows it to be in a league of its own. When testing the camera in the busy streets of Dubai, we could clearly understand that this camera not only pioneers in quality photography, that it has also solved age old troubles of low light and night time photography. We could see microscopic details through the lens of the camera, shadows, details from buildings and even the night sky seemed more vibrant and natural, almost mimicking professional photography. Another striking feature of the HUAWEI P20 Pro is how it uses Huawei AIS (AI Image Stabilization) technology that allows you to capture steady, clear and detailed video footage of scenes like a moving vehicle, ensuring you never miss capturing a moment or taking incredible long exposure images without a tripod. As we shot using the night mode for a majority of the time, we could notice the details that other smartphones struggle to capture, the crispness of shadows, the framing of windows and the sharp glow of neon lights. The 40MP sensor on the HUAWEI P20 Pro brought all these details to life in our photographs to give some of the most vibrant, clear and detailed shots taken in settings with low light at night. It is the AI master functionality that helps the HUAWEI P20 Pro automatically draw a grid giving you the best angle and proportions to capture that right moment at the best shot. Imagine a night shoot on a busy road, passing cars flicker with their lights on and off, the HUAWEI P20 Pro will be able to gain an overall understanding of the frame to produce the right image. We took shots of the glittering towers in Marina and we shot in the bustling streets of Bur Dubai, and we found that the camera works beautifully to produce photographs of professional quality. The HUAWEI P20 Pro, is truly a pro when it comes to night time photography, making us want to go out and explore more of the winding streets of Dubai. Huawei recently introduced Trade-in Service for the first time in the UAE to help customers instantly exchange their old android and iOS smartphones at the Huawei service centres for a new Huawei smartphone or accessories.